Natural chalk downland, untouched by modern agriculture, is now rare. 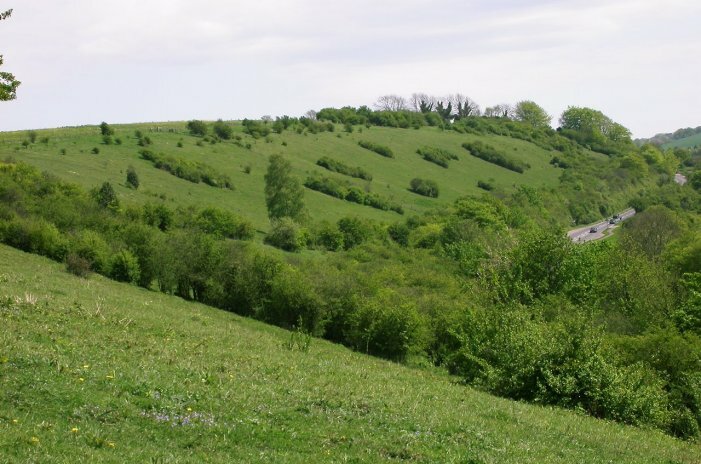 Renowned for its rich flora and butterflies, chalk downland survives only in small, isolated pockets. It once encircled Winchester, but most of it has been lost to housing, roads, golf courses, afforestation and agriculture. These losses make what is left very special. Magdalen Hill Down on the eastern edge of Winchester is a fine example, now restored to its former beautiful state by the Hampshire Branch of Butterfly Conservation. 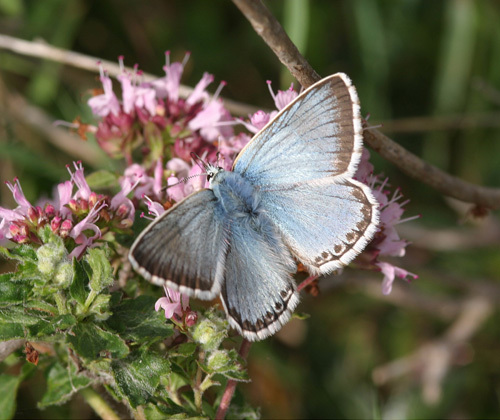 Years ago, the hillside that now forms the Original reserve was a paradise of wild flowers and butterflies. But by 1989 there was a heavy growth of wild privet, dogwood, bramble and hawthorn, which threatened the delicate flowers and the butterflies that depend on them. The scrub has now been cleared and is kept under control: only selected thickets are retained to give shelter and provide a habitat for birds and other creatures. Many shrubs and trees are the larval food plants for moths. 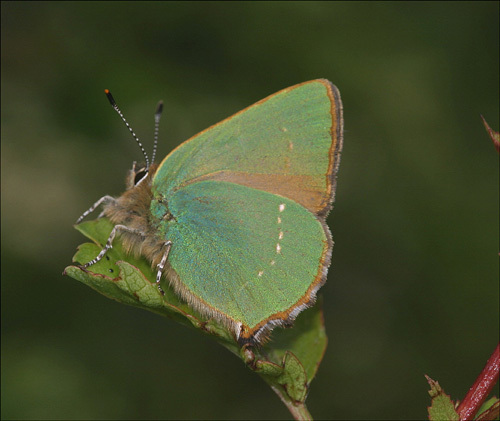 Volunteers play a vital part in the ongoing conservation work of the reserve, including regular monitoring of butterflies, moths and vegetation to check that the management is having the desired effect. The reserve is also kept in good order by grazing, mainly in autumn and winter which is why it is divided into several enclosures. Cattle and sometimes sheep are used. Grazing conserves the mixture of fine downland turf and the rich variety of plants upon which butterflies and their caterpillars depend. 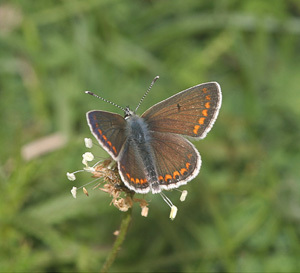 The wild rabbit population helps to maintain the areas of short turf that butterflies such as the Brown Argus need. Female butterflies are very fussy about where they lay their eggs, and the turf must be exactly the right height. Some species need short grass while others prefer it longer. The land is therefore managed to maintain a mosaic of habitats and turf lengths. No artificial fertilisers are used. In agricultural terms the whole reserve is 'unimproved grassland', but for butterflies it is paradise. Thirty-four species of butterfly have been seen at Magdalen Hill Down, including major breeding colonies of Brown Argus, Green Hairstreak and Chalkhill Blue. The caterpillars of the first two feed on common rock-rose, the latter on horseshoe vetch, and the hillside is yellow with these flowers in summer. Various orchids occur, and later in the year the reserve has fine displays of clustered bellflower, autumn gentian and autumn lady's tresses. The reserve was extended in 1995 when a further 32 acres was acquired. 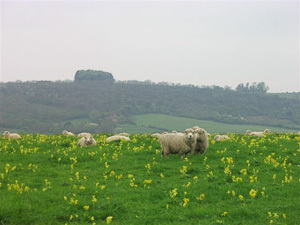 This eastern area, behind Magdalen Hill cemetery, had been intensively farmed from 1940 until 1995, with crops such as wheat, peas and daffodils. In 1997 Butterfly Conservation sowed it with grass seed specially gathered from other Hampshire nature reserves and wildflower seed chosen to recreate the flower-rich grassland that once flourished. As the years go by, more and more butterflies from the original reserve will colonise this new area. 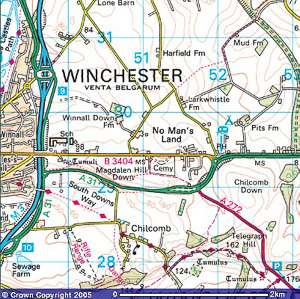 The site will thus provide ideas for landowners wishing to improve an area for wildlife. In 2001 the "wasp" spider, Argiope bruennichi, was found on the reserve and it has been regularly seen since then. 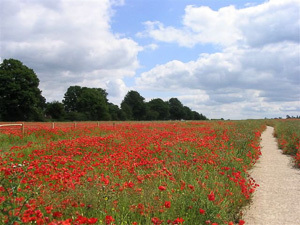 In 2004 a 55-acre ex arable field was added to the reserve in a joint scheme with Hampshire County Council. The poppies that appeared after the initial sowing have died out and their place taken by a wide range of perennial wild flowers. Magdalen Hill Down North affords easy access to visitors with limited mobility having a car park accessed by a RADAR key and a hardened path. 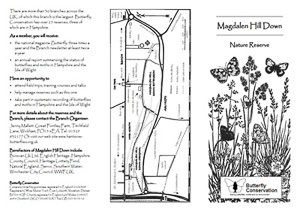 There is a car park opposite the Magdalen Hill Cemetery on the B3404 (at SU511295). See the maps below. On foot, then take the track going directly south which leads you to the reserve entrance.